Affiliate Marketing business is the most lucrative online business for making money online. Many people are making such a great income every month working as an affiliate marketer but some people fail and say Affiliate marketing a scam. But the fact is that they are genuine and it takes time to become a successful affiliate marketer. The initial stages are much tougher because you are new to the market and no one will know about you. The answer, how do people buy the product suggested by a stranger? Newbie marketers never understand this and tend to leave this business soon and report Affiliate Marketing a scam business. But in practice, it is not. Even for me, I have come across really a hard time in my business when I start a blog for affiliate marketing. I don’t know anything, how to run the blog? How to find the right affiliate product? It was like a nightmare but my mentor has thought all the right things and shaped me to become a successful affiliate marketer. The affiliate marketing business is really a good business and creates a passive income if you know to play well. At the same time, if you try to make any false practices you will ultimately end up in a scam. Let’s get through some discussion and decide whether the affiliate marketing business is really a scam (or) viable business for everyone. Before going further, tell me can you really make money by selling products (from affiliate business)? I am here and I am making money. So, what will be the answer is? It depends. The problem is not with the program, but actually with our mindset and thought towards the program. This business can make you rich but not quick. Many so-called-gurus and rich marketer’s claims that affiliate business can be done faster with little efforts and you can easily become rich. Some even say that you can make money while you sleep without putting efforts. Fire these gurus and learn the fact that these programs will take time to generate passive income of hundreds of thousands of dollars every month. Without putting your real effort and practice the to-do things daily as a routine, you can’t even make a single penny from this program. Affiliate Marketing a Scam is up to your own decision and how you think this as a viable program (or) not it will work for you. Minimal start-up capital. Some programs are free to start. No need to have own product (or) service. Work anytime, anywhere as long as you wish. Godowns, Stock inventory are not necessary. Can market the variety of products from electronics to automotive. Not a get rich quick program. Bad product (or) service can affect your credibility. The bad merchant may ruin your business. World Market and Toughest competition. No control on the business done by you. 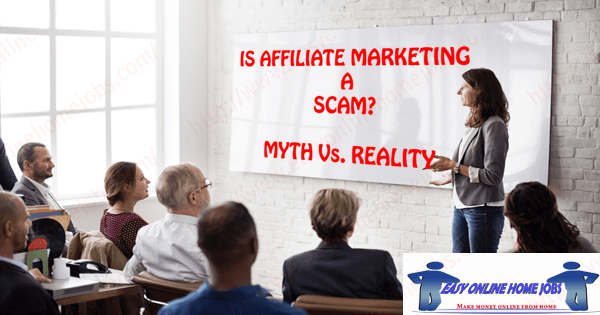 Let’s read some of the myth the describes affiliate marketing a scam on the virtual marketing world. Every one of us, even myself, has started the affiliate business to make money. But making quick money is not possible in this business. Becoming a successful affiliate takes time and effort. If you have any idea to make quick money (or) if you come to find any product claiming you to become rich, probably the corresponding affiliate program a scam. The reputation of this business is being damaged by these kinds of the get-rich-quick schemes. Really if there is a program, then why there are poor people in the world? All these programs and their promises are just some garbage collector which is of no use at any stage. The truest opinion is by creating a long-term goal, you can achieve success. Learn to build a Word Press Website and manage its hosting. Skill to find profitable Keyword and niche selection. Selecting the right affiliate product. SEO performing and traffic driving skill. Probably you can’t learn and come to work because it’s all practical thing and you should start a blog for affiliate marketing and learn while on the go. When time goes, you gain more knowledge and one fine day you will become a successful marketer making 1000s of dollars every month. Many newbie affiliate marketers will make this mistake in their beginning because they are excited to start a new business with lots of dreams and aims. They are so excited and fired up to learn all new things whatever they see on the Internet every day and follow one new Guru every day. They perform the different activities daily. DO NOT DO THIS. As I said above, affiliate marketing business takes time to build a fortune that returns your passive income online. This can be possible only if you focus all your concentration towards one goal. If you chose to start an affiliate business on Hosting because many people were scrambling around this thing. Then, after some days you fed up seeing no improvements. Then, you start another program on some other products, create a blog, promote and do all stuff to drive traffic. Again, you won’t get success and finally you will say affiliate marketing a scam. First concentrate on creating a blog for one affiliate product and make the site UP and running on its own, i.e) let the site receives a stable traffic and generates passive income. Then you will find time to build another site on different niche and product. This way you can slowly grow your affiliate program. Remember the first topic, people use to start affiliate business with a calculation that they can make money in just a month (or) two. So normally people create a blog to promote the affiliate product. They register a domain with hosting and install a premium WordPress theme to create a perfect design for their blog. Then they will do the keyword research to write articles and normally publish 1 – 2 quality articles every week on their blog, this is a myth created by most successful Gurus in the industry. Work for hours day and night, writing new contents, answering emails and engaging actively in comments etc.. and after some 2 – 3 months, seeing no results/sales they will say affiliate marketing a scam. WHY? Because visitors will not flood your blog whenever you publish an article. You should perform SEO activities to rank well in the SERP pages. At least you should stick with one program for 3 – 5 months consistently, involve content production activity and content marketing activities before you produce significant results. Again, it needs patience and concentration is the key to success in this business. A common disease among the many affiliate marketers was, “shiny object syndrome”, ie.) they jump from one program to another within a couple of months and will never concentrate to build a single solid platform. If some program trending today, immediately they register a blog and start creating content to publish on their blog, try new techniques and implement various efforts to deliver the output. They think they can, but not. This syndrome will not bring you success ever because it is not just selling some merchant products to someone unknown. When someone searches for something on the internet, the search engine will recommend your site and the visitor will land on your blog. They won’t buy instantly but they do a lot of research on the product (or) the services. Once they were satisfied, they will proceed to click the Buy button and you will get a sale. Simply, this process is called building a brand around the niche and it takes time. You should stick with the product couple of weeks, do deep research and build trust among your audience to get more sales. Without doing this, just jumping to newer products, get the tracking code and displaying on your blog won’t give you success. These kinds of action will cause failure but affiliate marketing program is not a scam. You can achieve success as long as you keep working hard, and learning new things. This is another common way of scamming novice people and showing magic numbers from their earnings to pull them to take their fake training program. People fall in to sign up these programs mainly after seeing the false earnings report from the so-called successful marketer. When you ask for current real proof, they don’t have actually one. Most of the scams will happen with affiliate marketing courses, but I agree there are many genuine training programs and courses on the market that still train people. Every business needs a proper training, but you should know what training you are going to take from the individual (or) a company. When you search the Internet for affiliate training program, you will get a lot of E-book, webinar, PDF documents and various kinds of information. You can get one and train yourself. But I will not recommend this, you should have a trainer to train you in this business to get things done. So, choose the training program wisely and stay away from scammers. Find the right training program, and the mentor who trains you through your own project is the nice way to achieve success in the program. Why do People think Affiliate Marketing is a Scam? Generally, this business has a good reputation and becomes of some of the above said misconceptions created a myth affiliate marketing a scam. 30-Day Crash course in Affiliate Marketing. Become a millionaire in just a few months. Setup this auto-pilot affiliate program and forget it. The so-called rich marketers usually follow these tactics to get new leads because they know how to target the right people who can easily fall as a prey in their system. All these are gimmicks and at the end of the training program, you won’t get anything good. Ultimately you will end up losing your money invested in the program. The successful strategy that worked for one marketer will not be a successful one to his trainee (or) other marketer’s. Each field is different and has its own trend and method of working. It is just a sales job where the marketer will be rewarded with a commission on every successful sale on behalf of the merchant. In the real world, the sales executives will take a bike and one demo product. They will roam in some locality, knock every door and show the demo to convince the people to buy the product. The same process here, but with little different, you are working in a virtual reality world and work from home. This system has a very old culture and many people became a millionaire from this Business program. But it’s not a get rich quick money making program. First, you strongly decide yourself that Affiliate Marketing Business is your goal. Then, you should start searching the Internet for various programs that really pay. List some program and find the best one that you think you can start today. Then signup their application form and proceed to market their product. Find the right affiliate program. Start a blog and write quality articles. Publish the content and promote the blog. Drive traffic from various sources and convert them into buyers. Tadaa, you are all set to start making money from this program. Affiliate Business is really a wonder and made most of the millionaires across the world. If you get well-trained yourself, then none can beat you out the ring. I too started my first online business as an affiliate marketer with a blog and faced lots of troubles during the first few months of this journey. Later, learned the system and involved me to test the program, researched a lot and finally making money every 30days from the comfort of my home. I became my own boss after my college studies. Affiliate marketing is a real, profitable business for the people who take seriously and it won’t work who think affiliate marketing a scam. Do you have any similar experience? I would love to hear your thoughts on this post. I believe healthy discussion always builds a quality people. How to become a Successful Affiliate Marketer in 2019?